We all love to see photos and video shot by drone. Putting a camera into the sky without the need for a helicopter has seen huge adoption for many, including law enforcement and more. Thermal cameras have been able to see things that we were once never able to. They have become a standard use tool for picking up heat signatures and displaying them to us in that fun orange and purple view. Law enforcement, the military, wildlife conservationists, industrial inspectors and more are putting these powerful inspection cameras into the sky. Join us today as we discuss thermal cameras, in regards to drones specifically, and list some of the best thermal camera and drone combinations. A thermal camera is a special camera that has been designed to capture and interpret infrared radiation, which is then displayed on a screen like any other camera. Simply put, thermal cameras are able to pick up any object that has a heat signature of any type. This means anything or anyone that produces infrared radiation can be seen through smoke, darkness and maybe even walls. To be clear, a thermal camera cannot see through a wall. It may be that the source of heat is enough to heat the wall, but these cameras are line-of-sight only. Even seeing through smoke can be difficult, if the smoke is dense enough to return as a solid block in the image. As you might imagine, there are several ways a pilot can gain value from this. We talk about law enforcement, as they are using thermal cameras to solve crimes and capture criminals. The cool vision ability of the first Predator alien is at our fingertips! Time to hide in the mud. On a more practical basis for you and I, thermal imaging is a powerful tool for home inspection. Scanning your house for leaks in the winter can save hundreds of dollars in heating costs, and help keep you warm at night. Thermal imaging is also valuable at night. I won’t explain to you the value of night-vision, you got this. A thermal camera consists of three main components, the IR lens system, the detector and the video signal generator. The IR lens system focuses the infrared light towards the detector. The detector picks up the infrared by allowing the infrared light to heat up the detector, this creates a secondary reaction. The secondary reaction is picked up by the video signal generator, which creates an image based on the rate, amount and location that the infrared light is hitting the detector. The result is imagery that looks like blue to red smears on your screen. Generally speaking, the images from thermal cameras use blue to indicate colder items and red to represent hot items. This may be on a set scale, or your camera may allow you to set the scope to look at. For example, a general scale thermal reading of your house in the winter would be all blue, except for any leaks or other warm spots, like people or windows. Use those exact same settings to look at your house in the heat of summer, all you would see is red. Specialized cases of industrial inspection may limit the thermal scale to just a few degrees, for precise temperature analysis. Finally, while the blue to red imagery is fairly standard, there are other color schemes out there. Some applications require high contrast colors, others may want to better see the environment, with less focus on the heat signatures. Thermal cameras have relatively recently rolled out to the wider drone market. This is partly due to a decline in parts and building costs. One of the leading companies in thermal cameras is Flir. You can find Flir powered cameras for a number of drones on the market today. Some of those drones come from companies like DJI, Parrot, Autel Robotics and Yuneec, some of which have their own thermal cameras as well. With the introduction of lower cost thermal cameras, many local government bodies have been able to afford the highly sought after equipment to improve their safety efforts. Some other major uses for thermal cameras on drones include search and rescue, surveillance and maintenance inspections. These services may have been previously provided by manned aircraft flight or by a human on the ground. Drones add that affordable simplicity to put the camera into the sky, and to get in nice and close to a building or bridge, increasing the efficiency of the thermal imaging. 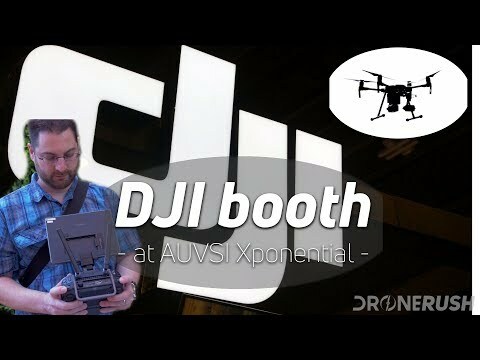 At AUVSI Xponential 2018, two major companies joined forces to bring high quality thermal cameras to high quality drones. Zenmuse XT2 is the latest and greatest thermal camera offered by DJI. Built in partnership with FLIR, the Zenmuse XT2 thermal camera builds on the success of the original Zenmuse XT thermal camera, which was one of the first cameras of it’s type to hit the prosumer drone market. 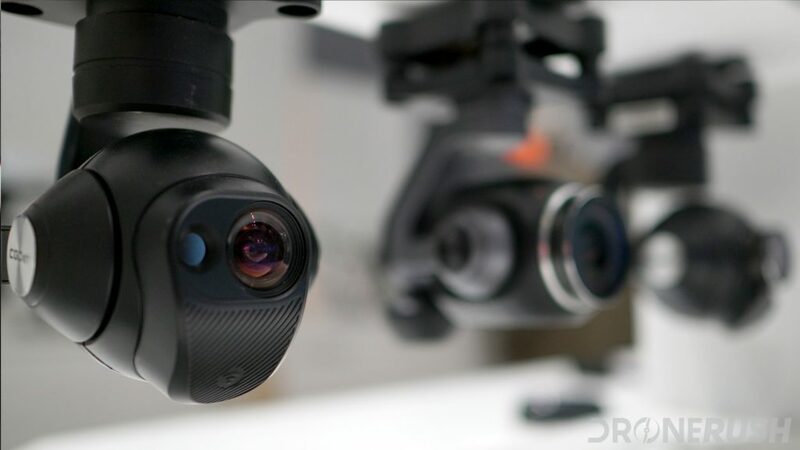 With the DJI offering, operators are able to capture both infrared video and normal 4K video simultaneously, depending on the configuration of your drone. The Zenmuse XT2 thermal camera is compatible with DJI’s M200 and M600 PRO series of drones. FLIR, the company that produces and partners with drone manufacturers to create embedded thermal cameras, also creates their own. FLIR has managed to gain a market share of around 37 percent of consumer purchases. FLIR offers a few thermal cameras for drones, the notable one is the FLIR Duo Pro R. Like the DJI Zenmuse XT 2, the FLIR Duo Pro R offers a normal 4k camera alongside a thermal camera for simultaneous shooting. The FLIR Duo Pro R can be used with a companion smartphone app for easy setup and use. The FLIR Duo Pro R thermal camera is able to be added to any PWM and MavLink systems. Check out the FLIR DUO Pro R for $5199. The Yuneec CGOET is a dual camera system that consists of a low light, full HD camera and a thermal camera for capturing infrared images. The Yuneec CGOET uses an unbranded thermal camera sensor, unlike the DJI and Parrot thermal cameras. As the Yuneec CGOET thermal camera is made and produced by the drone manufacturer, Yuneec, the thermal camera works exclusively with their H520 commercial drone. Check out the Yuneec CGOET camera for $1499 today. Parrot’s offering in the thermal camera space comes in the form of a kit. The Parrot Bebop-Pro Thermal kit comes with a Parrot Bebop drone along with a FLIR One Pro thermal camera, consisting of a Full HD camera with a thermal camera for simultaneous capture from both cameras. Parrot Bebop-Pro Thermal has been aimed at the construction and real estate markets, allowing for easy inspections at a low cost. The FLIR One Pro thermal camera is the same thermal camera that is used with smartphones, allowing you to use it with the Parrot Bebop-Pro and with any USB-C smartphone that is compatible with the FLIR One app. The Parrot Bebop Pro will be $1500 when it starts shipping. The WIRIS 2nd gen is the premiere offering from Workswell, a company that specializes in commercial thermal cameras and inspection cameras. Just like the rest of the thermal cameras mentioned, the Workswell WIRIS 2nd gen is also equipped with a visual camera, with a detachable lens system, as well as the thermal camera. You are also able capture simultaneous videos with both cameras. The Workswell WIRIS 2nd gen is available as a standalone or with the DJI M600 commercial drone. You are able to use the WIRIS 2nd gen thermal camera with any standard RC radio transmitter. Check out the Workswell WIRIS for about $4,600. The FLIR Vue Pro R is available in an extensive range of lens configurations and speeds. The 336 models have a lower resolution than the 640 model. Lenses are available from 6.8mm up to 19mm. This is a powerful standalone camera, or match it up with Mavlink or PWM controls from your drone to take to the sky. The FLIR Vue Pro R ranges from $2999 to $4699 depending on your lens and sensor selection. One of the earlier entries of thermal cameras for the drone market was the FLIR Duo and the matching FLIR Duo R (Radiometric variant.) The idea was simple, capitalizing on the abundance of GoPro ready drones, the FLIR Duo is roughly the same shape and size, has roughly the same I/O port configuration and operates in the same way as the action cam. In the same way that GoPro cameras have settled into the camera market, so too has the FLIR Duo settled into the thermal camera market. It’s not the best out there, but it is certainly one of the more cost effective for it’s size and capabilities. Check out the FLIR Duo for $948 on Amazon today. There you have it – a quick introduction to thermal cameras in relation to drones as well as a list of some of the best pro-sumer thermal camera and drone combinations currently available on the market. From market leaders such as DJI and FLIR to newcomers in the commercial space, Parrot. Do you think the commercial drone market will grow to become larger than the consumer and professional markets? What are your thoughts on thermal cameras? Share your thoughts with us via the comment section or at our social media accounts.